Kathleen and I have known each other since grade school, but this was the first time we took a trip together. We planned it last April. 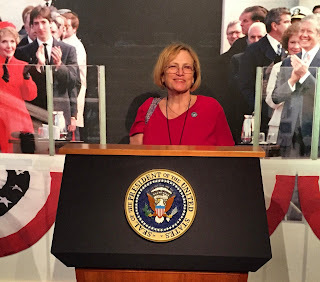 Kathleen wanted to see a show at the Hollywood Bowl and go to the Reagan Presidential library. So we pulled it together for part of Labor day weekend. 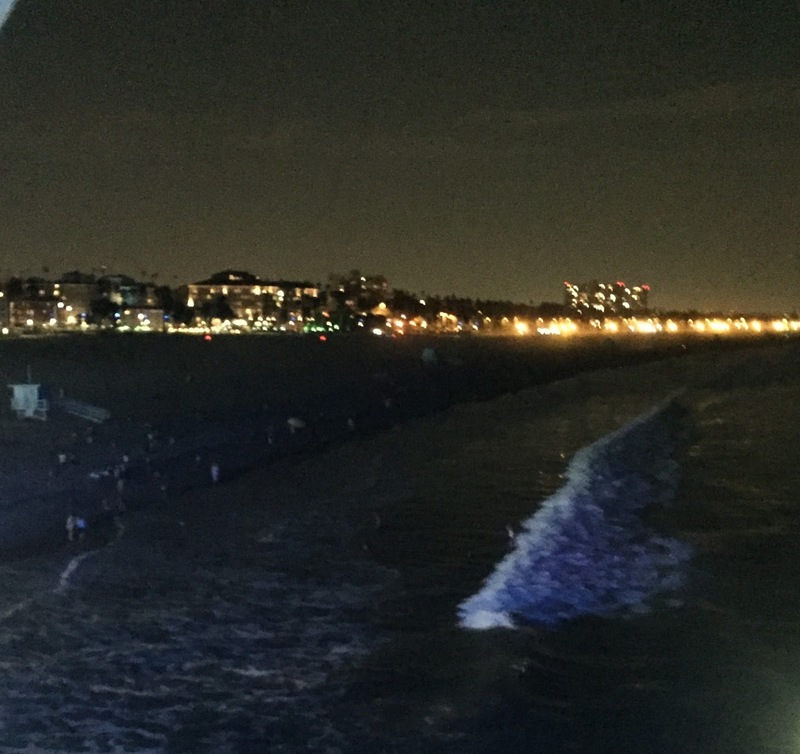 Usually, coastal California is quite pleasant, especially once the sun goes down. Unfortunately, we were there during a heat wave. We were really hot at the Hollywood bowl. A little bit of a breeze in the second half made it bearable. 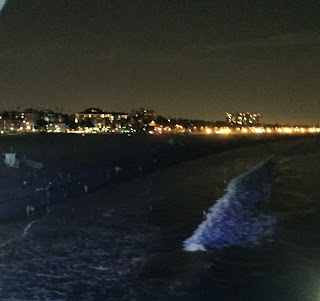 We saw the LA Symphony doing movie music. John Williams conducted the second half, doing pieces from Close Encounters of the Third Kind, Raiders of the Lost Ark, Stark Trek, Super Man and ET. It was all quite enjoyable. Many in the audience had light sabers that they waved in time to the music, which also made it fun. John Williams has collaborated with Kobe Bryant. He wrote some music to go along with a short animated film Kobe did of a poem he wrote called Dear Basketball. They debuted it there with Kobe making a special appearance to narrate it. That was an unexpected treat. 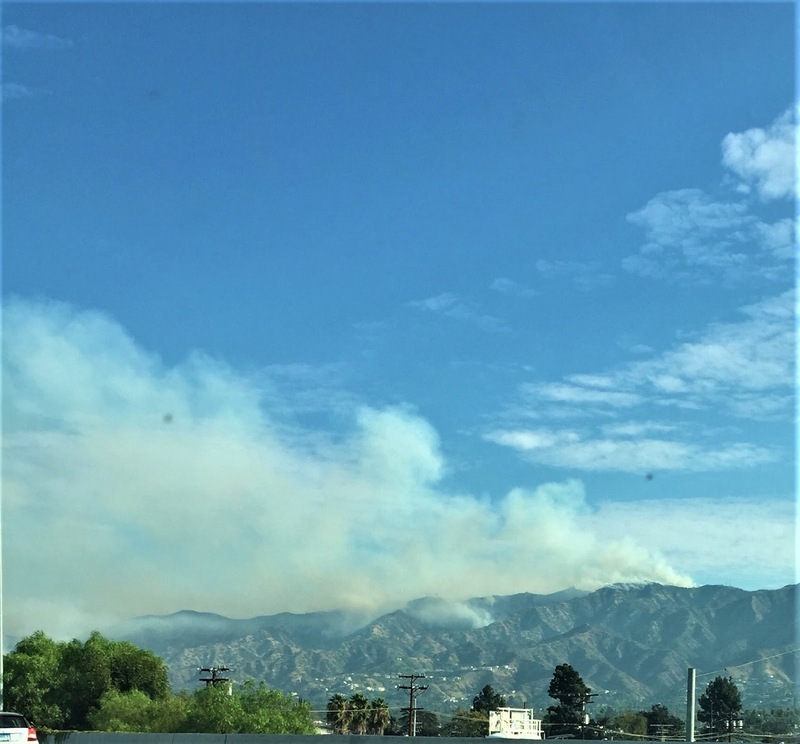 The La Tuna fire had started in the hills above Burbank. It burned over 7000 acres and generated a lot of smoke. Kathleen got some good pics she put on facebook. As the driver, I couldn't take many. 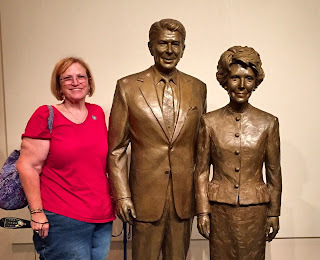 The next day, we headed to the Reagan Presidential library. It was very big and we spent four hours there, easy. It's on a hill top and has beautiful views. The gravesite of Ronald and Nancy Reagan. We got there before the library opened. There were three young men in their 20's when I got to the gravesite. They removed their caps, and were reading excerpts of some of Reagan's speeches. 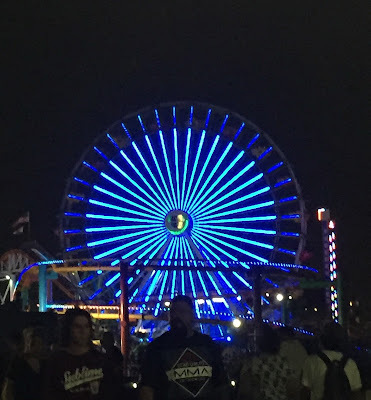 It was nice. Of course I had to have a pic with them. Nancy was very present throughout the library as she was in his life. Memorabilia from his time as governor of California. An exhibit on the POW bracelets, included one for John McCain. I was impressed by how much Reagan wrote his own speeches. This is a copy of a book he kept of quotes and thoughts to use. He was known for his radio broadcasts. 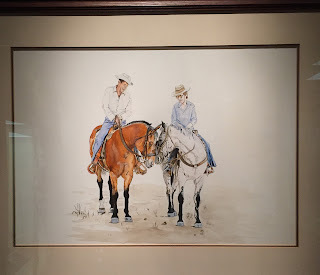 I loved this painting of the celebration for the release of the Iranian hostages. We got to walk through a replica of Reagan's oval office. Princess Diana's signature in the guest book. Diana dancing with John Travolta. In the collection of gifts given to the Reagan's as heads of state, is this portrait from an African nation, made of butterfly wings. Some of Nancy's famous outfits. There is a place you can stand as if you were giving the inaugural speech and see the teleprompters. 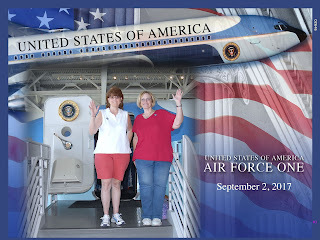 Amazingly, Air force one that carried 7 presidents is there, all inside! You can go through it. 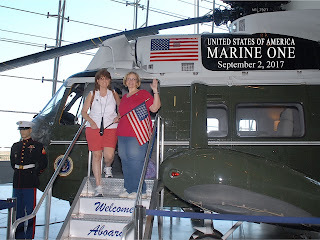 And Marine One was also there. There was a really interesting exhibit on Reagan's attempts to end the cold war with various Russian leaders, and his eventual success with Gorbachev. Again, I found it impressive. Tear down this wall speech, in Reagan's handwriting. 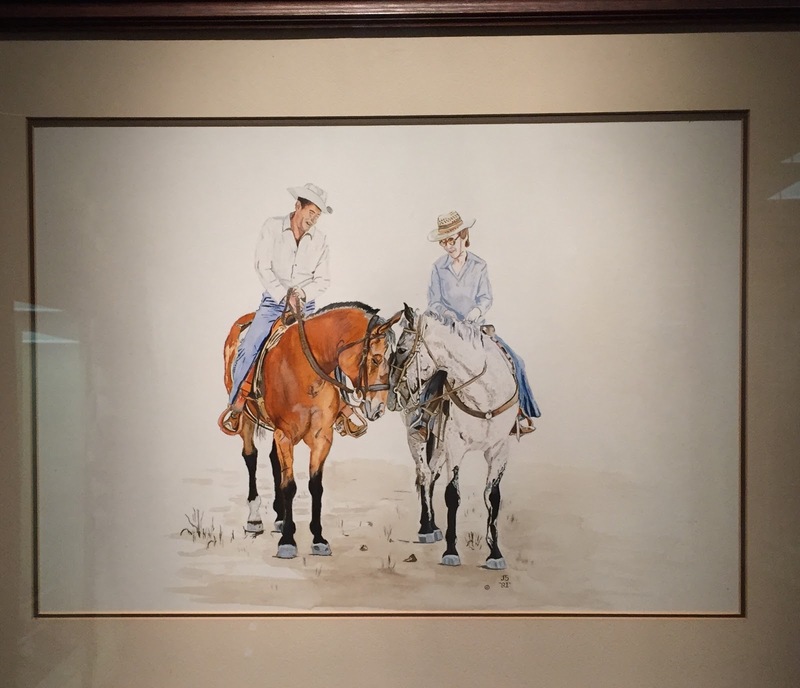 I loved this watercolor of the Reagan's. After a somewhat studious and serious morning, we went to the beach in Malibu and enjoyed being beach barbies for a little while. 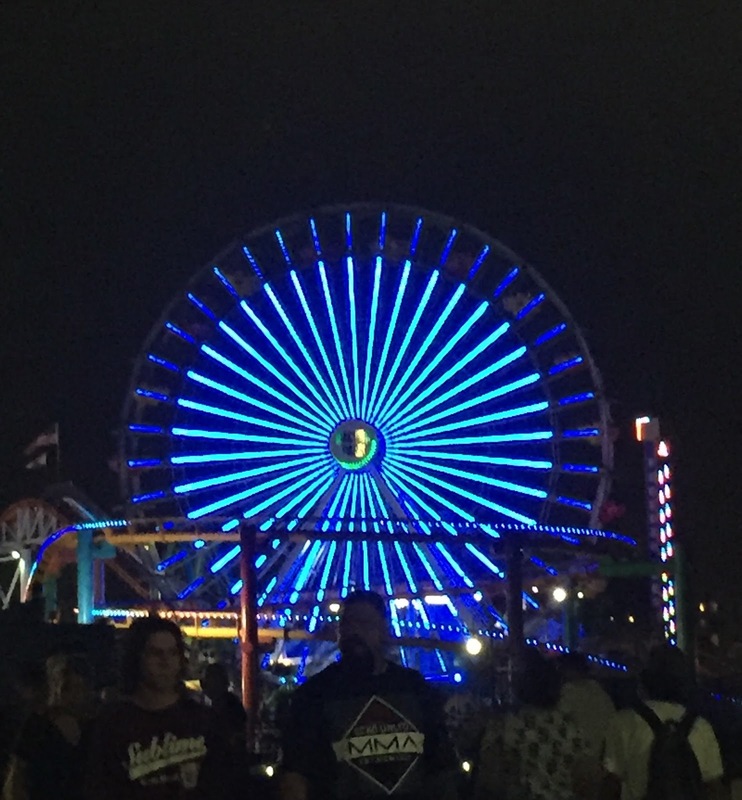 After Malibu, we drove to the Santa Monica pier and rode the ferris wheel. I like this pic of Kathleen with the full moon and coast line behind her. As we drove back to Phoenix, we stopped near Palm Springs for a tour of the Wind farms. It was interesting. They are enormous. The smaller ones cost 3 million each. The 25 story ones, cost 6 million each. But the make a 300% increase in investment over 25 years and they are a clean energy source.